TCN | What’s behind monarch butterflies’ late southward migration this fall? 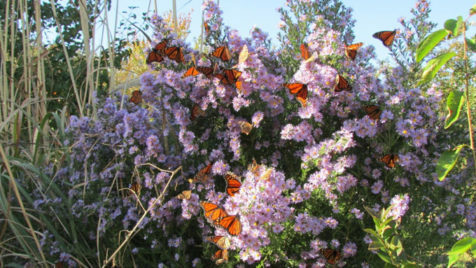 25 monarchs counted in this image of ‘Miss Bessie’ aster plants in tidewater Virginia in early November. Monarchs, expert at capitalizing on tail winds, can migrate 25 to 30 miles on “good days.” (To Taylor’s knowledge, the record is 61 miles, but he jokes that some of that distance must have come aboard a truck.) That means just-right breezes and lots of hours of daylight each day, with Goldilocks-like temperatures in the 60s and 70s. Warmer day-time temperatures in the 80s and 90s – just like cold waves – simply aren’t conducive to monarchs’ flight plans. Nor are fierce winds and breezes or temperatures short of 55 degrees F.
So does the warming atmosphere present an existential challenge to North America’s millions of monarchs? 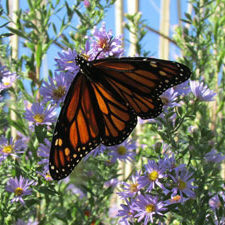 Or is it a threat instead to the migrations, rather than to the monarchs themselves? “The high temperatures that appear to be in our future seem likely to negatively impact monarchs as well as the milkweeds and nectar plants on which they depend,” he wrote. The vast monarch population across North America, Taylor explained, is “buffered,” meaning “the total monarch population is not all doing the same thing at the same time throughout its range – except during overwintering.” That’s when some 98 percent of North America’s monarchs are in central Mexico, the balance, from west of the Rockies, mostly along the Southern California coast. In addition, “there are overlapping generations, and variable climates and other conditions over space and time such that the threats to the population are also variable,” he said. In addition, “the amplitude of the variation in monarch numbers is much less than we see in many insects,” which means their year-to-year population numbers vary only marginally compared with most of their fellow insects. With so many of the U.S.’s monarch population over-wintering in central Mexico, their numbers may be at greatest risk during their overwintering. Like the sensitive timing of their migrations southbound, after all, they face timing issues also involving when best to head back north: Too late can mean they become hostage to rising summer heatwaves and drought, and too early means they may confront chills in Oklahoma and elsewhere along their long trips to their over-summering homes well to the north. No one ever said it’s a cake walk being a migrating monarch. A feast for the eyes as en masse they alight, surely. But not a cake walk for the butterflies or, for that matter, for the humans who delight not only on seeing large groups of monarchs, but also at the sheer splendor of their twice yearly south-north/north-south migrations. Bud Ward is editor of Yale Climate Climate Connections, Yale Climate Connections, an initiative of the Yale Center for Environmental Communication. YCC is a nonpartisan, multimedia service providing daily broadcast radio programming and original web-based reporting, commentary, and analysis on the issue of climate change.